Caden has been having a lot of stomach pain, especially at night. The last few weeks it has gotten to the point that he is also vomiting. I managed to snag a doctor’s appointment, and Caden, Elf, and I headed over to our pediatrician’s office. Because we have been dealing with this for so long, we managed to let ourselves be convinced that this was stemming for his autism and anxiety. Caden has always had more difficulty with emotions and processing the entire day’s experiences at the very moment he tries to lay down for bed. Given all of this, I expected a fairly quick in and out appointment. So imagine my surprise when the doctor decided to order bloodwork and x-rays. WOAH—this isn’t even close to good news. Well, from a medical standpoint it ended up being great news, but from a Caden has autism standpoint this wasn’t even the slightest bit okay. Our plan was doctor’s office, Walgreens, home. Say it with me: doctor’s office, Walgreens, home. One more time: doctor’s office, Walgreens, home. Nowhere in our scripting, planning, foreshadowing did it say doctor’s office, go to the lab for bloodwork, go to the hospital for x-rays, Walgreens, home. Get the point—this is a huge deviation from the plan. Further complicating the situation is the fact Caden likes to get his bloodwork done sitting on his daddy’s lap after his numbing cream has had a chance to work. Neither daddy nor the cream was with us. Poor Elf was getting nervous energy for his boy and his boy’s’ mommy. He may have aged a bit in those few minutes it took us to get to the lab. Then we walked in the lab and Caden decided he wanted to sit in the chair by himself. He sat there watching his Ipad while the phlebologist drew his blood. There were no tears, no restraints, no daddy, and no numbing cream. He even managed to answer an unprompted casual question during the whole process. She asked him what grade he was in and he replied 2nd. I was ready to leap for joy, but then I noticed her face. She was calculating or thinking or something and I was pretty sure whatever she said next wasn’t going to make any of us happy. I was desperately hoping it was a bloodwork issue, but instead she said “well I know someone who is your age and they are in 3rd grade. I just don’t understand why you aren’t in 3rd grade with your birthdate and all.” I was stunned into silence; I needed a response that didn’t involve crying, punching her, or teaching Caden new curse words. And while I was mentally fumbling, my brave little boy spoke up and said “well my Children’s House” (kindergarten in the Montessori fashion) “teacher really needed a special helper so I stayed another year to help her.” And with that I gave Elf a command and we headed to x-ray. I drove home though knowing that I had messed up. I should have had something to say. I should have handled the situation. I should have made sure that she understood that when a child walks into her office with a service dog that is clearly identified, no matter what you see or don’t see, you should assume that child has some difficulty or challenge in life. She should have known that challenges or not, people don’t deserve to be compared in that way. But it was my 8-year-old who handled the situation. I messed up. I’ve written about messing up as a parent before. Remember when I talked about thinking Caden didn’t recognize emotions when in fact he recognized them deeply but didn’t know how to handle them. And there have been many more instances that I have discussed on this blog. But the next one that I’m going to share with you had real physical implications for my blue-eyed giggle monster. We associated his pain with autism-based anxiety. The phone call from the doctor’s office later that day let us know that there was a very real medical cause—a blockage—that if left untreated could have had dire consequences. Thankfully, the medications eventually worked without surgery, and then we noticed how very wrong we had been. We thought his autism and anxiety increased, which in turn increased his pain and vomiting. But we had it all wrong. Little by little the blockage broke down and many of those difficulties that he was experiencing also broke away. The pain was in fact triggering his autism flight or fight response as well as his increased anxiety. As the treatment became more successful we realized that we didn’t need to start the biofeedback therapy that one of the doctor’s had given us as a last option nor did we need to increase any medications. We just needed to read the signs better; he did everything he knew to do to express and deal with the pain. So is this a blog about parenting failures? Yes. I think it is important for people to know that being a special needs parent doesn’t make you perfect. All of the talk about special people being given special children makes me nervous. If there’s anything special about us, it is because of our children and what they have taught us. The other failure here is that the idea of his pain being caused by autism and anxiety never sat well in my mommy-radar, but I let the “experts” convince me otherwise. Now that is one of those rookie mistakes that I am embarrassed to even have to admit to at this point in the game. Is this a blog about listening to your child no matter how they communicate? Yes. We need to realize that everyone communicates differently—regardless if they have an official diagnosis or not. It doesn’t matter if they can see, or hear, or talk, or what language they speak. We need to try harder to read the clues that are right in front of our face. 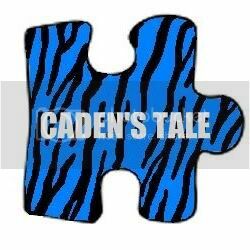 For us, we should have realized that Caden’s pain never moved; every time he was asked he pointed to the same spot. Anxiety would have moved around, but he consistently pointed to one spot—the very spot the blockage showed up on x-ray. Plain and simple, he told us and we didn’t listen. It’s another one of those experiences that has left me realizing that no matter how many degrees I have, no matter how old I am, no matter how much I think I know or try to teach my blue-eyed baby, he will always teach me more about life than I could ever imagine. At one point I thought I was leading this journey, but it becomes more and more clear to me every day that this truly is Caden’s tale. The adoption journey is one that I am still processing and probably will be for years to come. There’s so much wrapped up in “gottcha” day that never really gets talked about. You hear the fairy tale stories of instant love or the hero stories of “rescuing” a child but there’s also confusion, a (temporary) sense of hopelessness, and grief. Lots and lots of grief. Let me try and explain. When I walked off the bus in Zhengzhou, my son was right there in the arms of his loving and dedicated foster father. He was obviously well loved and happy. I had a moment that I was awe-struck; he was so beautiful, so perfect, and so mine. It was the day that I had been waiting for, the day that I was going to meet and hold my son in my arms as he had already been in my heart for months. I was in love. Then came the moment that the “hand-over” occurred and he was taken out of the arms of the family he had known and placed into mine. I knew what was happening, but all he knew was that a stranger was now holding him. What child could or would possibly be okay with this? I think back to when my oldest little and middle little were young and they barely let family members hold them at that tender age, let alone a total and complete stranger who looked, smelled, and sounded completely different than everything he had ever known. And then it was time for his foster family to leave, and it was just us alone to figure each other out. After many, many tears, this precious little boy fell asleep in my arms and we headed back to our hotel. At the hotel we had a chance to really look at one another. He stared at me and I stared at him. Looking back now, I think we were both in shock. He had lost everything, and while I had gained another son I felt totally and completely unprepared to parent him. I understood his grief, but I was surprised by my own feelings. I wanted to revel in the happiness and delight of a dream come true, but that didn’t seem quite right given my gain came through his loss. I also had a 21 month child that already had likes and dislikes and I didn’t know any of these. He had a system for expressing his needs, and I couldn’t decipher one cry from another. I even thought about giving him back because I honestly didn’t know how I could make things right for either of us. I was heartbroken for him, and I completely recognized that I was the cause of his pain and yet he clung to me because I was all that he had in that moment. He totally and completely trusted me the same way my newborn daughter and son did when they were born, and yet he had absolutely no reason to. That was a tremendous sense of responsibility that I didn’t know if I could handle. I wondered if our family would ever be able to blend in a way that allowed us to change to meet his needs as much as he was changing to meet ours. I didn’t want to “rescue” him because I knew he was fulfilling our dream, not the other way around. But here’s the thing, I was afraid to say anything about my feelings to anyone. My travel group all seemed so happy and content; I worried that there was something wrong with me. I couldn’t share my feelings with friends or family because my dream was coming true--what did I possibly have to complain about? And I didn’t know if I had the right to complain because my feelings seemed trivial compared to what this baby was going through. So I did the absolutely worst thing that I could have done; I shut down. When I finally was home, I couldn’t figure out how to turn my feelings back on. When I finally did, I cried. I cried a lot and I cried often. When I finally started researching all of this, I realized that I wasn’t alone in my feelings and I decided when I was strong enough I would share my story. My story doesn’t take away from the grief and loss my baby experienced, but it is still a valid story to tell. And much like the stories I have shared about autism and primary immune deficiencies, it is just my story. Others will have a very different story, but I hope that by sharing mine, they will find the strength to accept and share theirs as well. I could have prevented a lot of heartache on my part if I would have found the strength to talk about my feelings as I was experiencing them. Truthfully, I would have been in a better place to be the mother that my baby needed. Now that I look back on the past 5 months, I don’t regret our decision to adopt for a second. In fact, another adoption weighs heavily on my heart. I love this little guy with all my being and I think he does me as well. As he gets older though I am going to make sure that he knows how sorry I am that he had to experience such loss and heartbreak in order to join our family. I’m going to let him know that however he feels is exactly the way he should feel. And I’m going to tell future and present adoptive parents that however they are feeling those first few days, weeks, or months is okay too. The road to most fairy tales is paved with heartache, hardship, and trial, but you get through it together because that’s what family does.